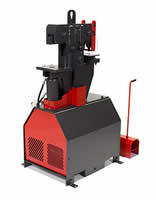 25 ton Edward ironworker is lowest tonnage Edwards ironworker, but is a workhorse for small fab shops or at home metal working. It’s punch station makes quick precise holes in steel sheet and plate. The open station allows for this ironworker to take on additional tasks as well, when optional tooling is added. This ironworker is a great tool for a very small fabrication shop or for a home metalworker. It includes a punch which can make a 1″ hole in 5/16″ steel. The optional Station allows for adding any of a number of additional tools. 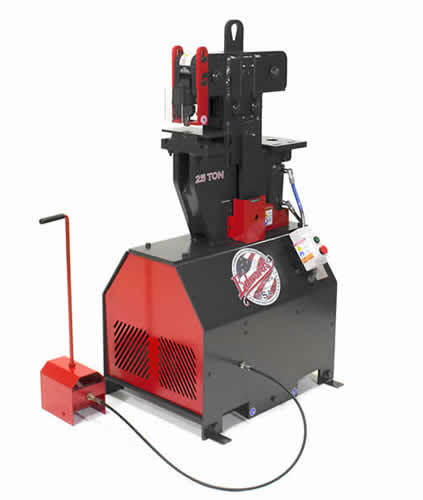 Pedestal Die Table Punch is the standard on the 25 ton edwards ironworker, for the punching of flange/web surfaces of 2″ steel angle, channel & beam. The open Station will accept a lot of the other types of tooling available from Edwards, notchers and shears, etc.